Don't you want to sit down at the negotiating table with complete unity from your side before you even start talking to Iran? Is that part of it? The French wanted to send a signal, as I say, to Saudi Arabia and to the emirates, that they were the tough guys. I think they would have found a way to object no matter what. Remember, this is a good example of personality and all that stuff doesn't make that much difference because John Kerry loves the French. They love him. He speaks French fluently. This is about national interest, cold and calculating. Now back here at home, Secretary Kerry is going to be going to the Hill to talk to the Senate asking for more time for negotiations to happen before anyone considers any more sanctions. There’s general agreement these sanctions have worked at this point against Iran. Bob Menendez is the chairman of the Foreign Relations Committee. He's pushing for further sanctions. He thinks that they're going to work and they would actually serve as an incentive. Does Secretary Kerry have a tough job here at home convincing people that he can get this done? He has a tough job. It's not clear that it will actually pass in the Senate. But the way to think about it is, you know, we have been telling the Iranians, don't create facts on the ground. Don't create new facts on the ground that make these negotiations more difficult. Don't complicate our lives by doing things that would suggest that you don't have goodwill. Well, we often forget it works both ways. We also shouldn't create facts on the ground and create complications for the negotiation. Both sides have to show that during this process of negotiation, you have goodwill and you're not trying to add further obstacles to the process. And just looking at it kind of from the outside, the big view, you have the main players all sitting down over the weekend to try to hammer this out. It didn't happen. It's debatable who's at fault that it didn't happen. But now, when they go back to the negotiating table, it's one notch down in terms of who's going to be sitting down at that table. Does that mean that chances for a deal come November 20 when they head back to Geneva are slim? It's not clear. I think that most importantly, the Iranians are going back to Iran, to Tehran to get clearance, I think, on some of these thorny issues. Do you think that could help or hurt? It would help in the sense that probably the foreign minister didn't have the authority to make a decision on a few crucial issues. If he goes back and if gets that authority, he comes back renewed. On our side, it allows the French and the Americans to get on the same page. But here's the fundamental problem, which is no deal is one where we're going to get the full loaf. And what you're listening to in Congress is a little worrisome, because at the end of the day, in any negotiation, you have to make concessions. The position of John McCain and Lindsey Graham and Bob Menendez seem to be we shouldn't have to make any concessions. Well, that's not negotiation, that's asking the other guy to surrender. And it's not clear to me that we understand that we're going to have to move from our position. Yes, we have an initial position. They have an initial position. The only agreement is going to be one where they move a bunch, probably more than we do, but we're going to have to move as well. You suggested at the weekend that some of the critics of this potential deal think that no deal is better. Are you suggesting that maybe they want the military option as the only solution here? Any kind of deal will still leave Iran with a very serious nuclear establishment. We know that. Iran has over 1,000 scientists who are working on its nuclear program, and they are allowed by the IAEA to do that kind of thing. So I think a lot of people look at this and say yes, you can have inspections, yes, you can have certain kind of constraints. But at the end of the day, that still leaves Iran with what’s called a breakout capacity, the ability within a few months or maybe within six months to achieve weaponization. That is a capacity that Japan has, that many countries that have civilian nuclear energy programs have. For those kinds of people, and I am thinking of Prime Minister Benjamin Netanyahu in Israel, they are really worried that any kind of capacity is too much. And in that circumstance, I think they would rather have a kind of road to a crisis, which would force either the United States or perhaps Israel to take military action. Of course, it’s not just Israel. If you speak to the Saudis privately or if you speak to the United Arab Emirates or the Kuwaitis or in Qatar, they are almost as nervous as the Israelis about these negotiations. So the political back drop behind which all this is happening, as you well know, is a very deep schism in the Muslim world between the Shias and the Sunnis. The big Sunni powers are Saudi Arabia, the UAE, Egypt, all the countries you mentioned, that are very suspicious of Iran. And this schism is playing itself out in Syria, in Iraq, where each side supports militias of their sect. And so Iran is seen as the ultimate Shia power. My own view is that the United States and the West should not get caught in fighting local battles for these people. We should be looking at this from the point of view of is Iran going to be a threat to the world, to the region, and how do we prevent that? We can make a deal on nuclear weapons. We can't change the complexion of Iran and make it Sunni or Shia, and we shouldn’t get into that battle. So, the Saudis have deep anxieties about Iran that go back centuries before its nuclear program. The West didn't move fast enough to expose the new softer tone of Iran as a ruse to ease sanctions and make it difficult for Israel to justify an attack. 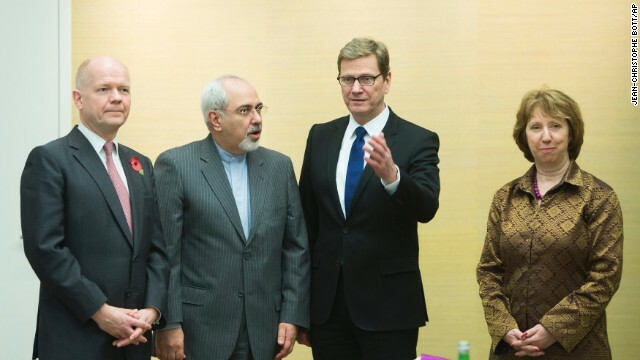 Iran's negotiating position clearly demonstrates their commitment to develop nuclear weapons. School solution for the West: keep all pressure points active and maybe even strengthen a few. It is unlikely that the West's position will be any stronger than it is right now. Likewise, the US did not move fast enough to support Egypt after the ouster of the MB. The door is now wide open for Putin and his generals to fill the void left by the US's failure to recognize that the MB was anything but democratic. Huge naval Russian base is planned in Egypt. It is not a possibility it is a reality. when we thought Obama made all possible mistakes the geneous surprises us all and makes new mistakes. However Obama will be out in 3 years and USA citizens will pay the price for these mistakes. I admit, I don't know as much on this topic as I'd like to, but I would like to think that getting some kind of deal out there, lifting some sanctions on Iran, that would be good. I really can't see the point in economically harming a nation because they want to aqquire nuclear energy. I'm almost certain just about every 1st world nation has nuclear energy capabilities (correct me should I be wrong), and it seems unfair to try and hurt the general public of Iran because it tries to do the same, then again, maybe I'm wrong. No Jace, you're definitely not wrong here. In fact, France gets 85% of it's electrical energy from it's nuclear plants but doesn't want Iran to do the same. This is clearly a double standard! The bottom line is that the West covets Iran's oil and is quite willing to go to war to get it just it did with neighboring Iraq!!! Per NPR America is one of the world's largest oil producers, and close to 40 percent of U.S. oil needs are met at home. Most of the imports currently come from five countries: Canada, Saudi Arabia, Mexico, Venezuela and Nigeria. China is one of Iraq's biggest customers. United States oil consumption in 2012 will be about 4.7 million barrels a day, or 20%, lower than it would have been, if the pre-2005 trend in oil consumption growth of 1.5% per year had continued. The International Energy Agency (IAE) says that by 2015, the United States will surpass Saudi Arabia and Russia as the world's biggest oil producer and is on track to become energy self-sufficient in two decades. The vehicles are also set for new fuel efficiency standards by 2020. You are wrong Iran is oil rich. They don't want nor need nuclear energy. They want a bomb. This past weekend they the leaders went on tv and discussed ending "The West"
Where is your proof of this rubbish assh?! Just a hypster. Iran hasn't started a war for over 150 years. Wish I could say that for US, France and Israel! ASHURA: Is my favorite Muslim holiday, where Shiite Muslims celebrate in the streets by self-mutilating themselves. @ kaina, there is nothing for free in Israel. It is a country on stolen land funded by US Taxpayers. @Jamal Stolen land? It seems you dont know about this thing called history. Iran Is a theocracy and its supreme leader is a fanatic with delusions of a world wide Caliphate. Fareed Zakaria is an Islamist and he should be deported, The man always defends the enemies of western society why does this man have a job in America? If you ask me he should work for Press TV. Fareed was born and raised in Mumbai India. Muslims hate Indians. How could Fareed be an Islamist? You wouldn't say that if you knew back in 1983 one Russian man save the world from destruction. Petrov judged an incoming nuke from the USA report to be a false alarm, and his decision is credited with having prevented an erroneous retaliatory nuclear attack on the United States and its NATO allies that could have resulted in large-scale nuclear war. Russia doesn't want Iran to have nukes as well. It would turn into a source of instability, not only for the region, but for the former Soviet countries bordering on Russia in the south. Whatever Iran concedes will not satisfy US President Binyamin Netanyahu. He wants all 77 million Iranian men, women and children forced into bankruptcy. And President Netanyahu's congress will submit to whatever he demands. Why people go into the bible and come up with stuff? I hope everyone of the people who wrote something on here read this. Israel/Israelites is not the same as Jews/Israeli. the N!gg@s of the world not Hamite/Africans is Israel. Now let get to Iran!! Its about the oil! Iran is building a pipe line to cut Gulf states out of a large share. one going to India and the other going to the EU market. that in itself will make Iran not only a middle east superpower,but a power superpower. If you get mad, write about me in a bad way, or disagree i know your type. White/Gentiles or you a Jew/Esu or Edomites..Jesus black. Good posting, S.O.N. Yes, the West sorely wants to get it's grimy hands on Iranian oil no matter who suffers the consequences of it's actions. After all, Iran has the fouth largest oil reserve in the world next to Iraq, Russia and Saudi Arabia. I am not surprised to read this biased article from an apologist for the Iranian regime and and war criminal Assad Mafia, Zakaria think he can outsmart people who new his agenda, keep on the right track Zakaria, some ignorant Americans will believe you for sure. I see a lot of ignorant, hateful, pro-war, anti-Iranian comments here. One would think that this was some kind of a Tea party Convention being held on this web page. No wonder they call ours a sick society since only right-wing fanatics, ignoramuses and psychopaths want this senseless war with Iran and there seem to be a lot of them crawling here which makes the rest of us Americans look bad!!! I was thinking the exact same thing. People say the most ignorant things. That they do Hamza, that they do and that nauseates me to no end! Enough of this stupidity already! i was thinking look at the muslim apologists , a big people forget what the 12th iman is and shia belive in suisicde and that death is glorious. they would risk their whole country for a possable nuclear war . The sunni want america to take out iran . the sunni want to take assad. An agreement between Saudi Arabia and Pakistan could see the Gulf state deploy ready-made nuclear warheads in the event that Iran crosses the nuclear threshold. That's according to a report by BBC Newsnight, which cites "multiple sources" suggesting "generous" Saudi aid for Pakistan's nuclear own program was given as part of an understanding by the two countries that, if and when Saudi Arabia required use of nuclear warheads, the Pakistanis would provide it to them. amid a significant deterioration in US-Saudi Arabian relations – the result of growing distrust over the current American administration's readiness and ability to contain the Iranian threat – the prospect of Saudi Arabia "going it alone" is not so outlandish. Signs of a more independent and aggressive foreign policy by the kingdom have already emerged, including guarantees of aid to fellow Sunni Arab state Egypt, as US support for the interim government in Cairo wobbles, as well as threats of a regional escalation to counter Hezbollah's growing influence in Syria. A recent Wall Street Journal report on the crisis in relations between Washington and Riyadh – including a direct announcement by Saudi Arabia's spy chief that his country is scaling back its cooperation with the US – noted that Saudi diplomats had threatened US officials that Riyahd could "seek alternatives" to the mutual-defense treaty between the two states. The biased tone of this sharticle sort of smacks you in the face pretty quickly doesn't it? As an American and a native of Atlanta I've got to say that reading this piece was disturbing. No more business from me and mine that's for sure. War is bad so let us all unite in stoping it.PERIOD. Lots of story lines here. The one that won't be discussed, for reasons that are in fact absurd, is the role of the national israel-slash-jewish lobbies and coordinated international efforts by Jewish groups to have Americans pay in blood and treasure for wars for "Greater Israel" and some variant of the Oded Yinon plan. The Jewish neocons in the Office of Special plans fabricated evidence to get the Iraq war Israel wanted (and yes, people like Cheney wanted war profits, oil contracts in dollars etc). We weren't supposed to talk about the predominance of Jews amongst the chicken hawks. But neoconservatism is little more than 5th Columnist Zionism. How many will die this time because of the petrodollar, dying anyway, or central banking, controlled by a tiny elite, and that most verboden topic – wildly disproportionate Jewish money, power and influence? If a bomb goes off in Charleston, and its immediately blamed on Iran, we will know it is Israel. King David Hotel bombing, Lavon Affair, USS, Liberty, and several more, to include 9/11. I have a strong desire to drop a large runny stool on your forehead. try it on lindsay graham he would a good volunteer. I enjoy taking long romantic poops on the beach. The Israelis and their AIPAC friends intend a with with Iran whether America likes it or not. AIPAC cry of the neo nazi and muslim death cults. Go back to bobbing your head at a dusty old wall. I've pretty much withdrawn from watching and reading the news over the past couple of months..it started with that exhausting GOP debt ceiling drama. So many pundits and talking heads trying to make a living out of producing the biggest black clouds over every positive event that they can. There's never anything good or even promising happening in the world according to the media. This is ridiculous..the U.N. has been negotiating for years to try to get the Iranians to deal, to no avail. Now that they are on the one yard line of acheiving a nuclear weapon capability, why would they stop. Sanctions only hurt thepeople of Iran not the Military (who actually run the country, much like Egypt)... They will not negotiate in good faith....ever....this is a fools errand by Kerry. The reemergence of Russia as a powerful ally, and the computer virus (Stuxnet) that set their program back farther than we probably know anyway are a couple of reasons why they would be trying to play the cards that they've been dealt in the interim. Oh look Mr Z has gone back to his normal, closed and vetted response wall, because he'd rather control criticisms of his opinions rather than bother with freedom of speech . How very Muslim of your sir !! "Israel started lobbying from the outside without even knowing what was in the deal"
This is the sole reason a deal was not reached. A deal was about to be signed when Israel put pressure on France. Leave it to the French to be spineless. Most likely not because the P-5 already knew Netanyahu was going to do everything he could to sabatage a deal. They knew this well before they even got to the negotiating table. It is illogical to think that a concession would put us at risk from Iran. We have the military power to take out their entire nuclear program within a few days just using our air force. The intense monitoring consisting of the IAEA and our own intelligence capabilities would give us an emediate notification if Iran starts playing games with the deal. That requires politics of a different kind, than what we have in today's world. Not going to happen. I hope we keep trying to find a peaceful solution. More time is needed for diplomacy. Wow!absolutely amazing and interesting to see read this comment pretty good question to raise,really this issue become more and more serious for international community,world leaders,super powers,and iran. why and what is behind the worry! my amazing,expert,genius,most beautiful honey Margaret Brennan CBS news report http://www.cbsnews.com/8301-505263_162-57612294/ho... really very interesting to see,where the money came from and where the money going outside Iran! Most important and interesting point Margaret mentioned congress want to put more tougher sanction over Iran.congress said sanction is not tough enough to change Iran's mind,while other big point Margaret mentioned congress also said its unfair for Israel to make deal with Iran. Margaret also mentioned white house urges to congress its too early to act,nuclear peace talk still going on,more sanction may be send wrong message to Iran and world to make peace through diplomacy,so its too early for more sanction. Margaret also mentioned Israel ready to strike in Iranian nuclear facilities and nuclear sites,its big threat against Israel national security,but big question what its real threat,while sanction hard hit to country and Iran struggling at the moment from tougher sanction,what Iran able to do any kind of war,cost of war!though Iran said Iran never going for make nuclear weapons,though Iran has capability to make nuclear weapon. Margaret mentioned big point if Iran agree to reduce level of nuclear fuel called uranium enrichment deal become more achievable,and against nuke deal lift some sanction regarding to oil and banking which mostly support Iranian economy.we are very hopeful and we are doing our best to solve problem through diplomacy,we don't need war,we need peace,people of U.S,international community know very well war is not solution of peace.